After watching the rally for four days, climbing up mountain tracks under the blazing sun to reach Special Stages, we needed some rest. A short drive back to the expressway near Corinth, and we were speeding westwards towards Rio. No, not that Rio. Although the E65 calls itself an expressway, it is in parts a two or three lane road. But, they’re working on it, and one day it will be a proper four-lane highway. Even so, it’s an easy ninety-minute drive. I hadn’t planned on going as far as Rio, where there is a long suspension bridge linking West Greece with the Peloponnese, as I wanted to take the pleasant thirty-minute ferry ride from Aigio. Unfortunately that stopped operating when the bridge opened, so we had a longer drive than expected. No matter. The scenery is spectacular, and there were many spots where we paused to take photos. 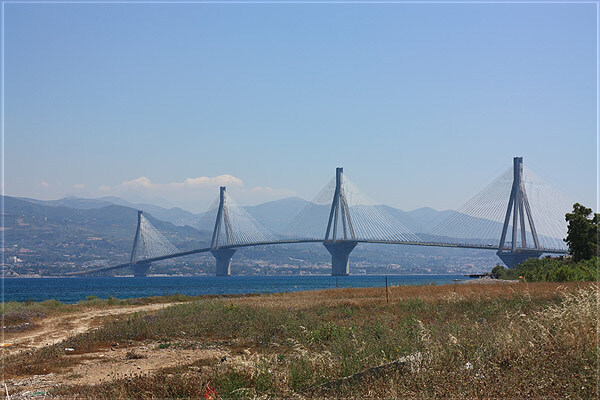 From the opposite end of the bridge in Antirrio, the road follows the coastline to our ultimate destination at Itea, a journey of about an hour or so. The road still calls itself the E65, but this part is definitely just a meandering two-lane affair. Along the road fom Antirio to Itea. 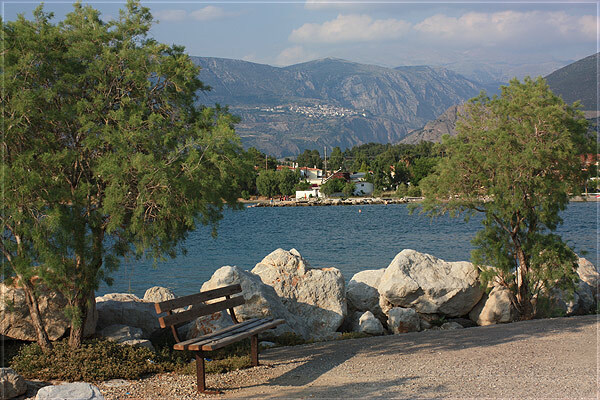 Itea is a relaxing fishing village of about 6000 people. Small enough to be cozy, but large enough to have most amenities. After searching for a couple of days for a supermarket, we found two! Our hotel, the Trocadero, overlooked a small marina, the bay, and the mountains beyond. Sunsets were especially spectacular with constantly changing shadows across the hillsides. The hotel seemed quite new, very clean, affordable, with very pleasant people and good service. Recommended. 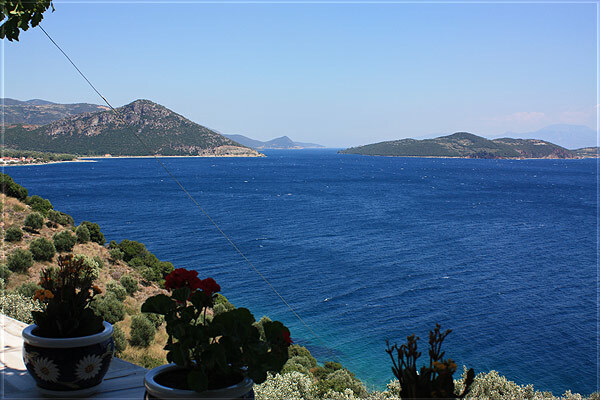 The town has a long waterfront and a small harbor, so there is no shortage of restaurants with a sea view. Once the summer begins, evenings are warm and breezy, and the whole population seems to be out and about, walking, chatting, eating and drinking. A typical Mediterranean lifestyle. View from Itea, with Delphi in the distance. 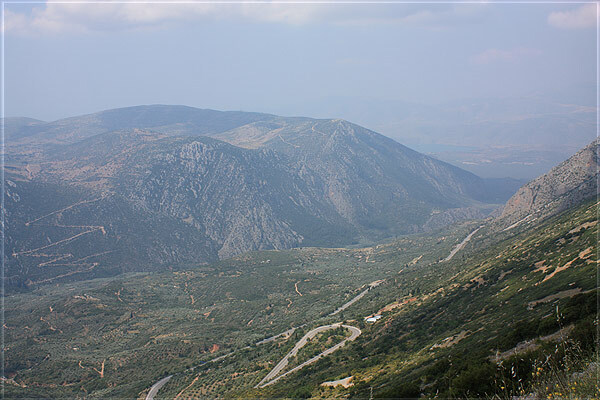 Itea is particularly well placed for touring, as the town of Delphi nestles in the hillside above. It looks close, but once you leave a coast road, any drive in Greece seems to involve going one kilometer in one direction, round a hairpin bend, one kilometer in the opposite direction, another hairpin bend, and so on, until you have tacked your way to your ultimate destination. Even so, traffic is light, drivers are polite and make it easy for you to pass, and so Delphi can be reached in less than thirty minutes. The town is small, quaint, has spectacular views back towards Itea and the coast, but is a little too touristy. Personally, I prefer the next village along the mountain road, past the ancient ruins. Arachova is a little larger. It seems like a real place where real people live, rather than Delphi which has the appearance of only serving the tourist trade. The shopkeepers seem a little less pushy, and the restaurants are better. 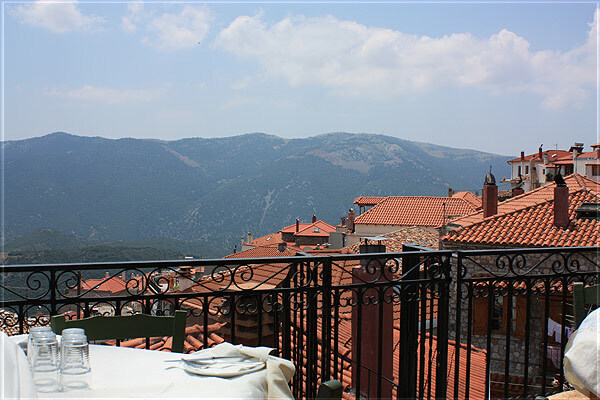 Time for lunch in Arachova. 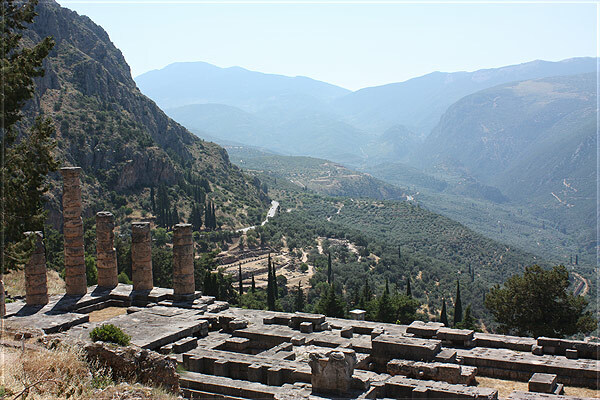 A trip to this part of Greece has to include the ruins at Delphi, seat of the Oracle. If you like museums, then that is your starting place. The ruins lie both above and below, and to see them all you need the constitution of a mountain goat, especially if you are there under the heat of the sun. An early start is definitely recommended. 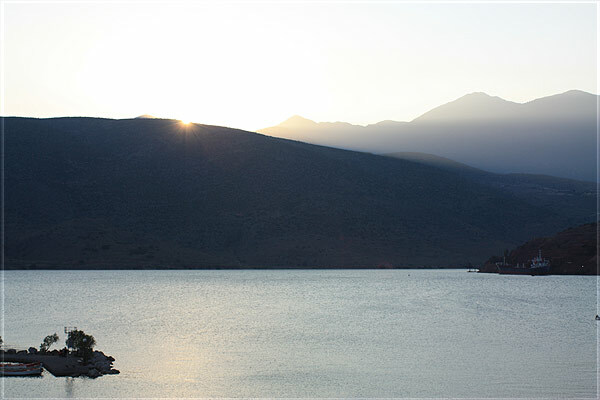 It also means you avoid the tourist buses which arrive in convoy mid-morning from Athens. For me, the main attraction is the whole atmosphere of the place, rather than being awed by the ruins themselves. Piles of stones and a few remaining columns only give you a small glimpse of what the place must have looked like 2500 years ago. But, if you can stagger to the mountaintop stadium, you can appreciate the enormity of the place, and view it in the context of being built on a steep mountainside, all those centuries ago. Quite a feat. Some ten years ago I stood on the roadside at around midnight and viewed the area under a full moon. I tried to imagine how it would have looked during construction. I pictured the area covered with tents. Thousands, perhaps tens of thousands of workers sleeping, exhausted after a day of chipping away at rocks, and moving boulders up the mountainside. The place has a unique atmosphere. As I mentioned, further along from Delphi is Arachova. Here, you can turn left and travel up the mountainside, eventually reaching the ski center on Mt. Parnassos. It seems strange passing through areas with wooden houses high on stilts, ready for a few meters of snow, when it’s 30 degrees outside. Although, to be honest, it wasn’t that hot. We left Itea at 9am, where it was already 32 degrees, and by the time we’d climbed more than 2000 meters – in the car, of course – it was a breezy 16 deg. Well worth a visit though, with spectacular scenery, best viewed on the trip down. Heading down from Mt. Parnassos. The roads are fun! Apparently the mountain was sacred to Apollo and is inhabited by Corycian nymphs, but they must have been on strike the day we visited, along with the rest of the population. More on that subject in my next entry. If you leave Itea to return to Athens, as we did, allow about two and a half hours, maybe three if you have to catch a flight. The journey is straightforward, but even with GPS you can easily make a wrong turn on the Athens bypass. Although new, Athens airport seems crowded, and negotiating a baggage trolley needs a degree of patience (something I lack, so I’m told) so allow plenty of time for check-in procedures.